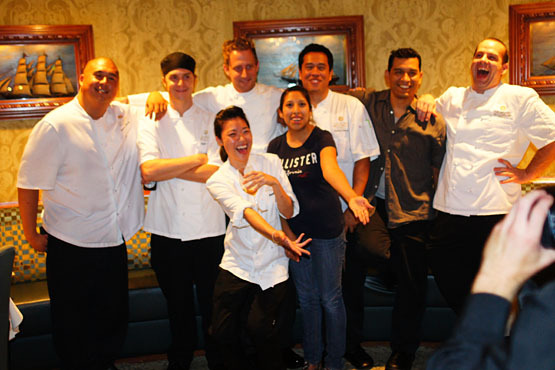 When Michael Voltaggio announced his departure from The Dining Room, I don't think that anyone was terribly surprised. Really, it wasn't a matter of if, but when he would leave. 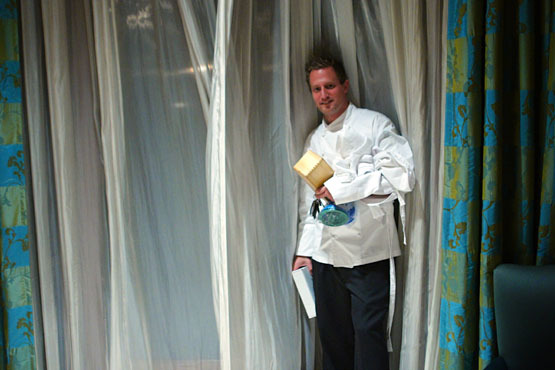 For a chef lauded by many as the most innovative in the Southland, taking residence inside a stodgy hotel could only have been seen as a temporary solution. That Voltaggio would eventually start his own restaurant was a foregone conclusion. And so it was. When The Langham announced that Voltaggio's final night would be July 17th, I made sure to quickly secure a spot, to give The Dining Room one last, final hurrah. Clearly, I wasn't alone in this sentiment, as the two weeks prior to the shutter were booked solid. 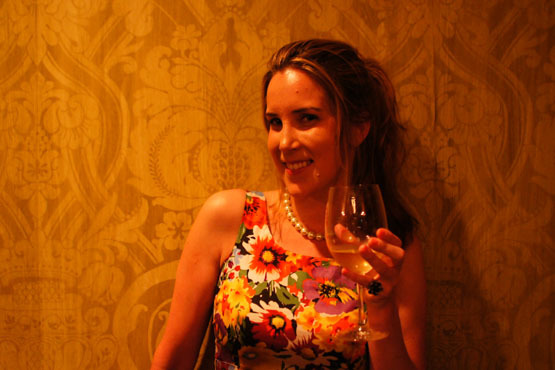 I know that Eater LA's Kat Odell, hosting two out-of-town editors from Chow, made it out a couple days before me, and let's not forget about Lindsay William-Ross from LAist. On this final night, foodie types present included a large contingent from volunteer organization Boobs4Food (Christina, Jessica, Katherine, Patricia), Felicia of The Food Ledger, LA Times Daily Dish contributor Krista Simmons, Chef Makoto Okuwa from Sashi, Névé ice founder and former Church & State barman Michel Dozois, Ryan of Epicuryan, and SBE biz dev head Saul Cooperstein (the man behind the pastrami). 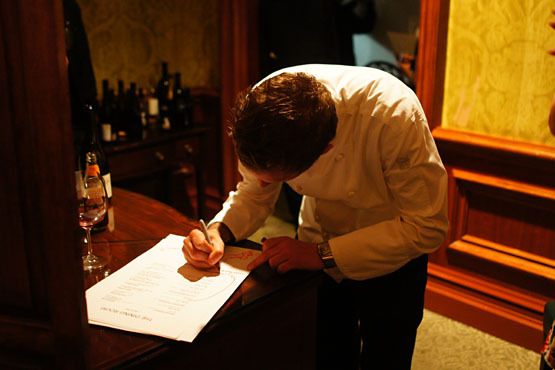 Above, we see the menu for the final dinner service. Of course, we requested to run the gamut, getting a sampling of all 21 course (plus an extra surprise! 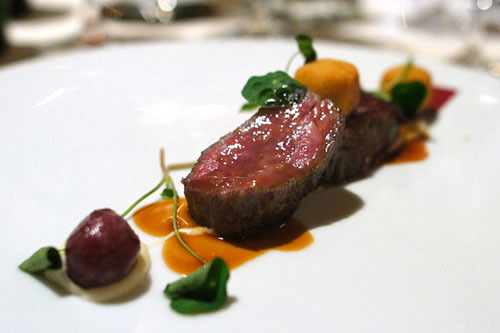 ), with pairings by Sommelier Joshua Goldman. Click for larger versions. 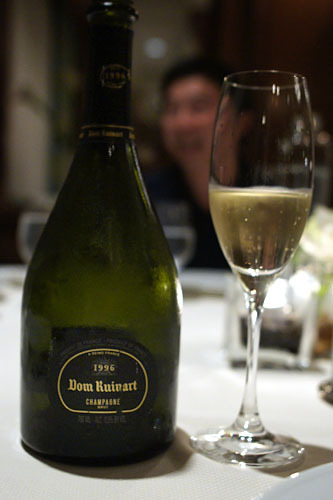 Upon being seated, we were presented with a real treat: 1996 Dom Ruinart Blanc de Blancs Champagne! More austere than the '96 variant of the other Dom, this was a crisp, toasty tipple, with plenty of straw, citrus, and minerality on the palate as well, leading to a slightly hot finish. 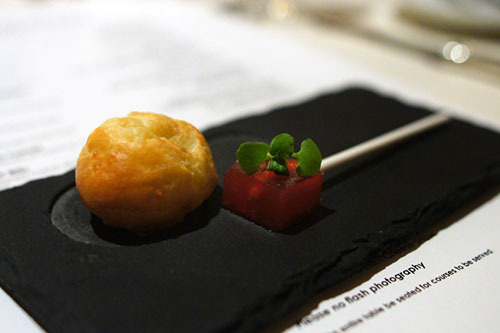 The amuse bouche course consisted of two gorgeous bites. 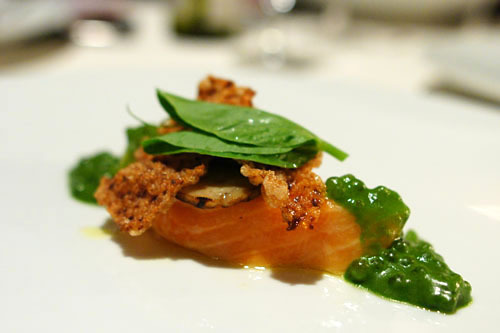 First was the Tomato Pâte de Fruit with Basil and Sea Salt; this demonstrated a classic flavor interplay between basil and tomato initially, but then transitioned to an unabashedly sweet, sticky finish. More impressive, though, was the Gougère with Caviar Cream. It was much like a standard gougère to start, but upon mastication, it let forth a fantastic burst of caviar cream, instantly coating my palate with a cool, briny goodness--a perfect foil to the relatively subtlety of the cheese puff. I think we each could've handled an entire basket of these! We were then brought two types of bread: bacon rolls (their heady aroma was detected as soon as they got close to the table!) and country sourdough. 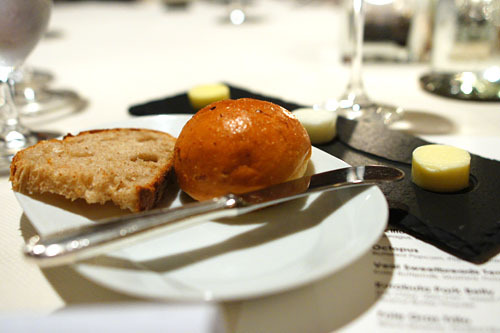 A troika of butters was then presented: Vermont salted, goat's milk, and Échiré unsalted. 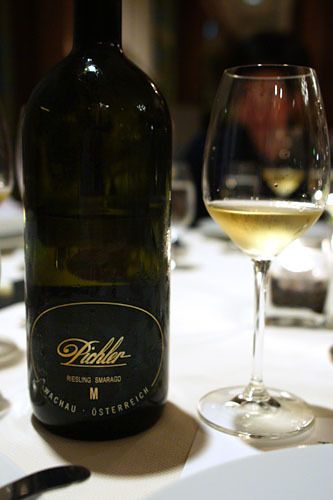 For our first two courses, Goldman paired a wonderful Riesling, the 2002 FX Pichler Smaragd "M" from Austria's Wachau region. Unlike your typical German Riesling, this was done in a drier style, with a bit more minerality and petrol, but still with the requisite notes of stone fruit and citrus. The wine worked flawlessly in cutting the weight of the crab and buttered popcorn. I had this same course on my last visit here, and on that occasion, I found the popcorn a bit overwhelming. Not so this time around. 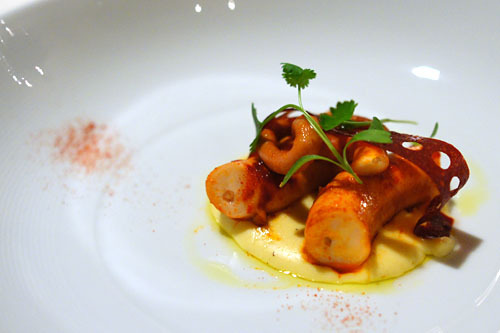 It was so much more well-integrated into the dish, playing off the briny-sweet flavor of the octopus, but without drawing too much attention to itself. I also appreciated the slight bit of heat from the piquillo, as well as the clean, vegetal finish provided by the coriander. As regular readers will know, I'm no fan of soft shell crab, often finding it rather monolithic and one-note. Given that caveat, I will say that this was probably the best SSC I've ever had. The crab itself was cooked to a faultless, crisp, onion ring-like consistency and was appropriately restrained, showing off a bit of sweetness that linked up nicely with the paired corn. The key here, though, was the Old Bay seasoning, which countered the crustacean's weight perfectly. 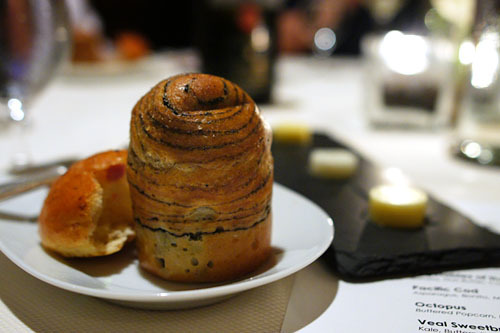 As good as that bacon roll was, they were clearly saving the best for last with this truffled brioche. Positively imbued with the heady essence of black truffle, it easily stood on its own, even without the application of butter. Two pairings followed for the next duo of dishes. 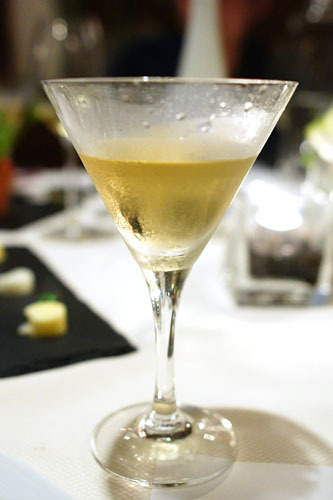 For the presentation of vegetables, Goldman concocted a cocktail of fino sherry, vermouth, maraschino, organic bitters, and atomized green Chartreuse. This was a sharp, bracing, herb-tinged libation that deftly played off the spareness of the veggies; not everyone at the table could quite handle it in fact. The pair for the kampachi, on the other hand, was much easier to appreciate. 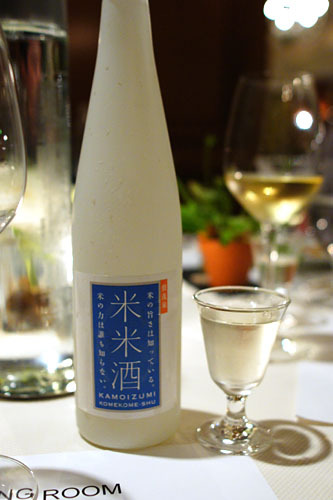 The Kamoizumi Komekome "Happy Bride" is a 60% polished sake from Hiroshima, and showed off beautifully crisp, floral, fruity notes with a pronounced sweetness that only seemed to intensify with time. 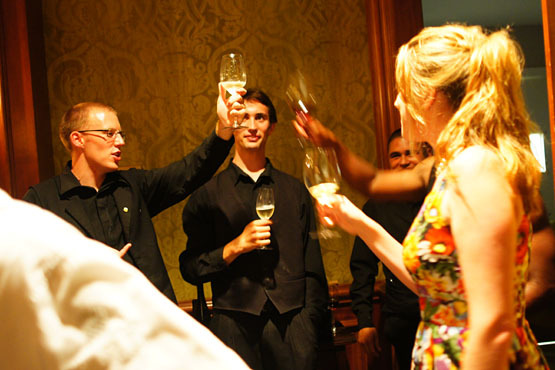 Goldman even likened it to an off-dry Kabinett Riesling. 3: Vegetables of the Season | Burrata, Nori Butter, Coffee-Cardamom "Soil"
Here, Voltaggio presents a refinement of his seemingly gargouillou-inspired presentation of vegetables. 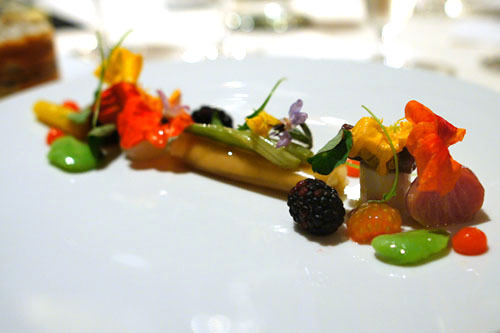 First off, we have a plate composed of 15 different types, nasturtium, and burrata. It's a weightier mix than before, with a more noticeable sweetness and a heftier contribution from the cheese; if we restrict the course to just this plate, I think I prefer the previous iteration for its clarity. 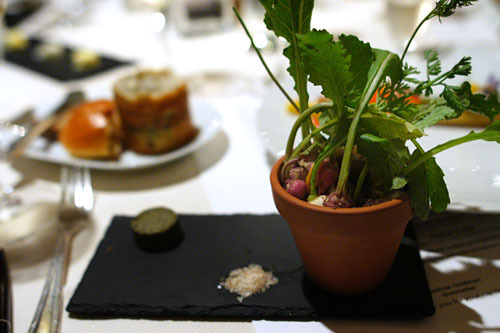 What takes this course over the top, though, is the potted arrangement of carrot, radish, and turnip. The bright, crisp, unadulterated flavors of the root vegetables were so forcefully presented here, but then, at the same time, they were wonderfully accompanied by the trio of nori butter, smoked salt, and coffee-cardamom "soil." 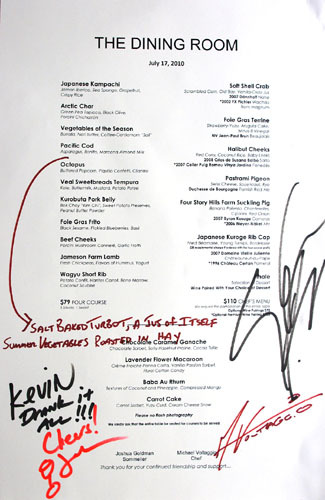 I couldn't help but be reminded of similar concepts from Chris Kostow at Meadowood, Jeremy Fox at his Animal stint, and of course, René Redzepi at Noma. 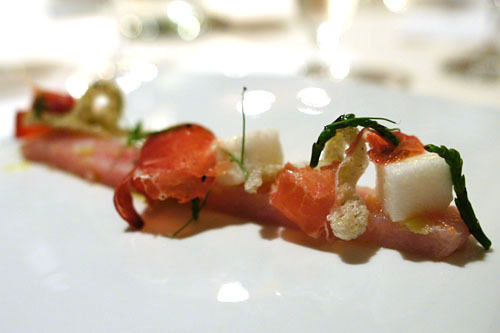 Last time, I had a version of this crudo-esque dish done with shima aji, and I'm not sure which I prefer. The fish was amazingly clean in flavor, with just a great trace of citrus tang courtesy of the grapefruit. 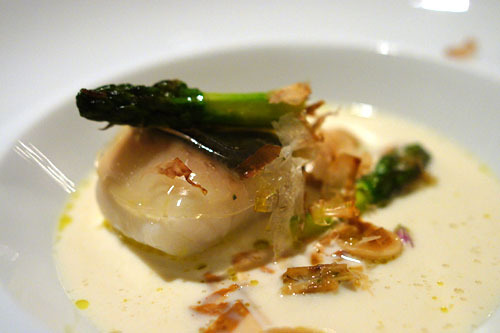 To this canvas, the "sponges" added hints of umami, while the jamon was delightfully salty in savor. The crisp rice, meanwhile, mixed things up texturally. Nice! 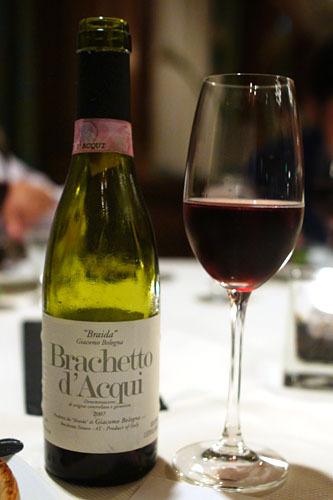 Foie gras craves the sugary stuff, so Goldman brought us a couple half bottles of the 2007 Braida Brachetto d'Acqui, from Piedmont. This was a lightly effervescent, brazenly saccharine, almost syrupy wine that was loads of fun to imbibe, a ruby red elixir with juicy strawberry notes all 'round. A great play with the sesame brioche! 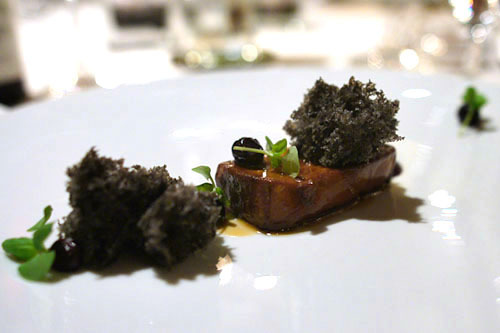 Voltaggio surprised me previously with the strength of his hot foie gras, and he did it again here. 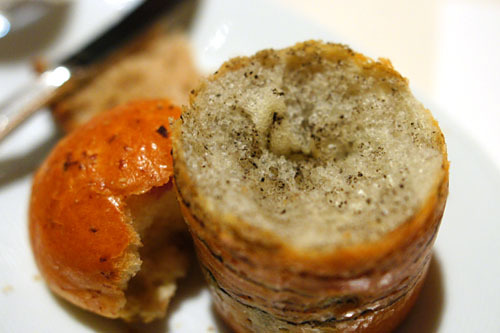 I was very skeptical of the light, fluffy, black sesame "aerated brioche" at first, but it did a stupendous job at moderating the heft of the foie. Tasting the dish, the initial sensation was pure, unmitigated liver-y goodness, but the flavor profile then transitioned to the unmistakable smack of black sesame on the finish--it reminded me of Chinese tangyuan! The terrine, on the other hand, was a bit more conventional in its pairing. 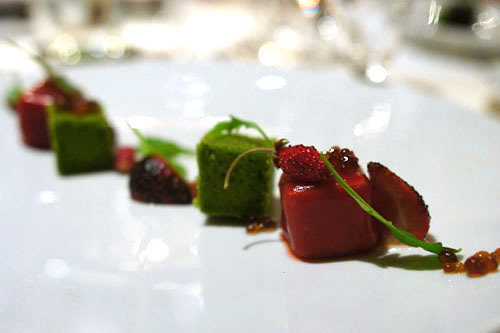 A strawberry and yuzu gelée enveloped cubes of foie gras, while lending the liver a sweet temper. What was interesting here, though, was the arugula "financier" cake, which gave the dish a slight vegetal astringency, while providing a bit of textural play. Finally, the whole interaction was topped off by a bit of salt, as well as the great tanginess of the Minus 8 spherifications. For the trio of fish to follow, we were given the 2007 Crnko Rumeni Muskat, a dry, but not too dry yellow Muscat from Slovenia. I quite liked this one, with its lovely floral and stone fruit flavors, all backed by a great acidity. This was almost too fishy, too intense at first, but strangely, the more I ate, the more I enjoyed it. 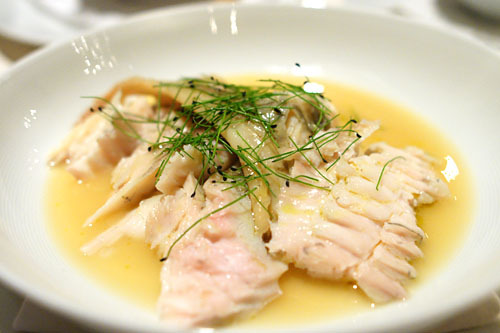 The cod itself was characteristically strong in flavor, but even this was heightened by the application of a sheet of dashi gelée, and then kicked up another notch by the use of katsuobushi--bonito shavings. All in all, an in-your-face, smoky, umami-soaked celebration of briny goodness, tempered only somewhat by the bitter zest of asparagus and sweetness of almond milk. 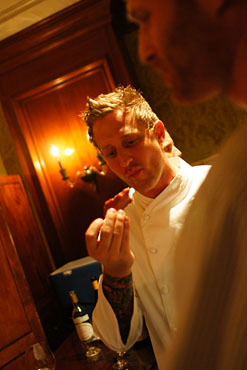 Halibut cheeks are oft considered the most prized part of the fish, and here, Voltaggio looks toward Asia for inspiration. Leeks add a bright accoutrement to the fish, but the stars here are the red curry purée and crispy coconut rice, both of which lend a distinct, delectable Thai tinge to the course. Some of my dining companions felt that the cheeks were a touch over, though I personally didn't have a problem with texture. I'm inordinately fond of peas, so it's not surprising that this was my favorite of the three fish presentations. 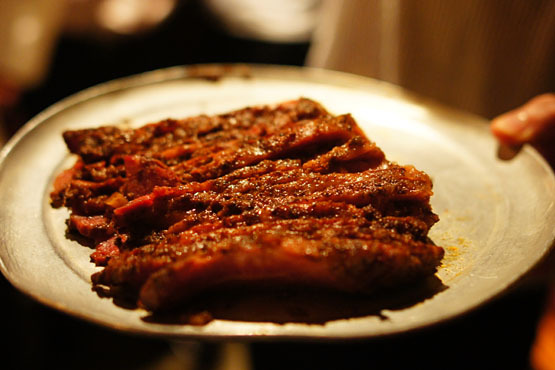 The char showed off its distinctively soft, succulent, oily flesh, and was a pleasure to eat just by itself. 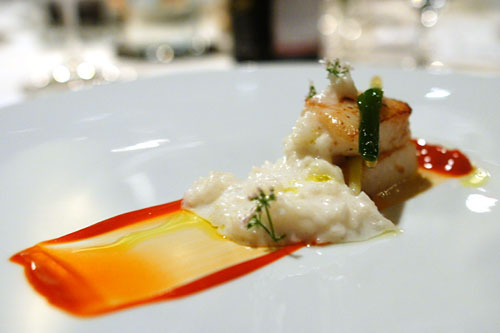 Its gravity was enhanced by the porcini crackers and olive syrup, but the crux of the dish really was the green pea tapioca, which lent a light, bright, green flavor to the dish that expertly countervailed the power of the fish. 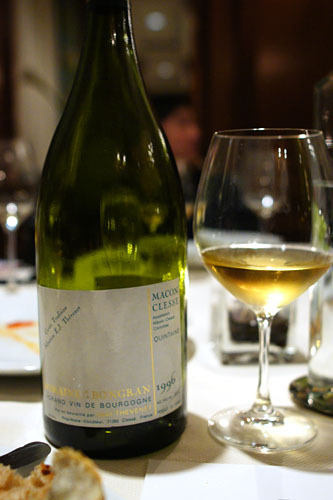 Our next wine, served in magnum form, was the 1996 Domaine de la Bongran Mâcon Clessé Cuvée Tradition Sélection E.J. Thévenet, a white Burgundy. It gave us plenty of straw and barnyard flavors, intermixed with oak and minerals, which went beautifully with the next course. 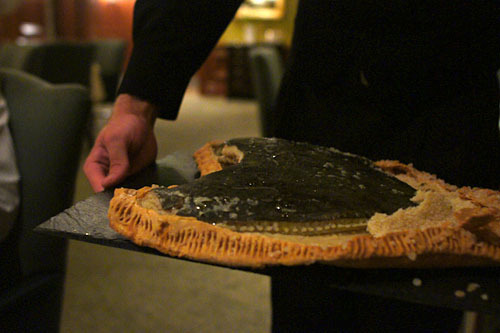 Here, Voltaggio surprised us with an additional off-menu course, an impressive, classically prepared turbot, baked whole in a salt crust. The turbot was dense, meaty, and firm, with a subtle, delicate flavor heightened by a briny jus made from its scraps--a very enjoyable eating experience indeed! 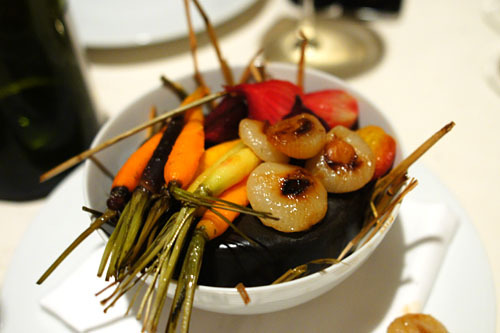 To go along with the fish, the Chef paired a mishmash of hay roasted carrot, beet, and cipollini onion. Imbued with the grassy essence of hay, the veggies demonstrated a rustic tinge that was a refreshing departure from the norm. Beer was the ticket for the next two courses. 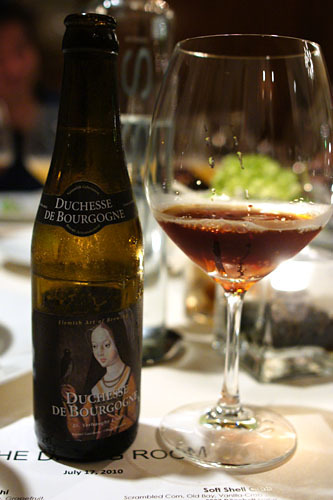 First was one of Goldman's most famous pours, the Duchesse De Bourgogne Flemish Red Ale from Belgium's Brouwerij Verhaeghe. Meant to be paired with the "pastrami," the fruity, tart beer is likened by Goldman to a Dr. Brown's black cherry soda, a mainstay in Jewish delicatessens. 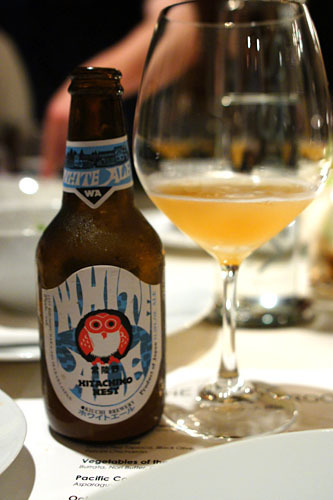 Next was another fantastic brew, the Hitachino Nest White Ale from Kiuchi Brewery in Japan. This one, a witbier, showed a wondrous hoppiness tempered by sharp notes of citrus and herbs--simply stunning with the sweetbreads. 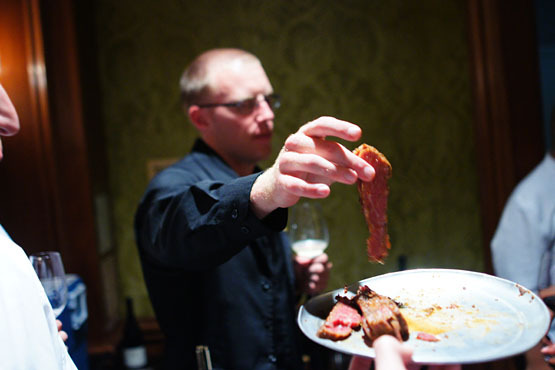 The pastrami pigeon, a sort of reimagined Reuben, is quickly becoming one of Voltaggio's signature dishes. 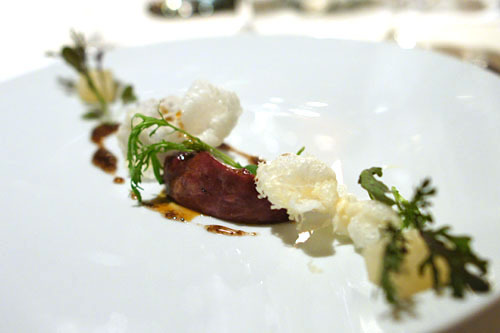 The squab, cured to a spicy salty smoky goodness, was deftly counterbalanced by the smack of the sauerkraut gelée, while the paired bits of puffed cheese added a palpable weight. Finishing things off was a rye jus and some zesty mustard greens. Interestingly, the kitchen sent out some beef tongue pastrami to go along with the dish, and this too was quite scrumptious, though smokier and a bit more decadent, I'd say. Next up was simply one of the tastiest version of sweetbreads I've had in a while. 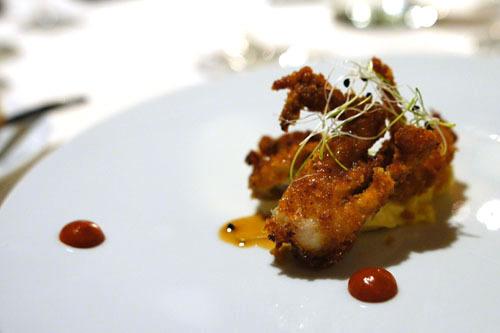 Encased in a layer of tempura batter, the sweetbreads itself was actually surprisingly delicate, yet focused in sapor. 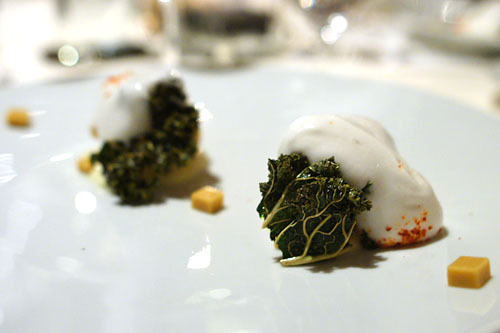 Creamy, crunchy, savory but subtle, it was perfectly tamed by the fried kale and cubes of Dijon. My favorite aspect of the dish, however, was the dollop of potato purée, which, in concert with espelette dust and buttermilk foam, gave the dish a fantastic finish that just begged for the Hitachino. 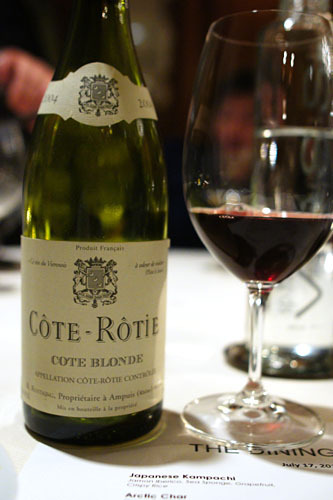 Our first dry red of the night came in the form of Rene Rostaing's 2004 Côte-Rôtie Côte Blonde. This was sort of your prototypical northern Rhône wine, showing off plenty of meaty, spicy, and peppery notes, intermingled with dark fruit and chocolate. A big wine for the hefty courses to follow. 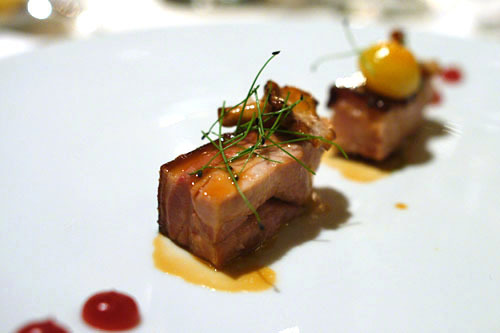 Tender, yet with a bit of "toothsome" bite and a wonderfully chewy skin, the pork was delightfully in-your-face, and only moderately subdued by the application of candied saffron cippolini and chanterelles. 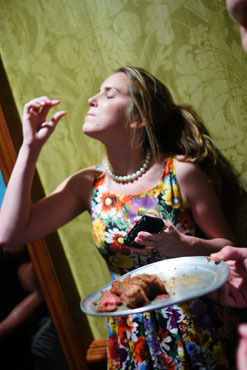 I loved how this so ardently conveyed the quintessence of porcine sapor. 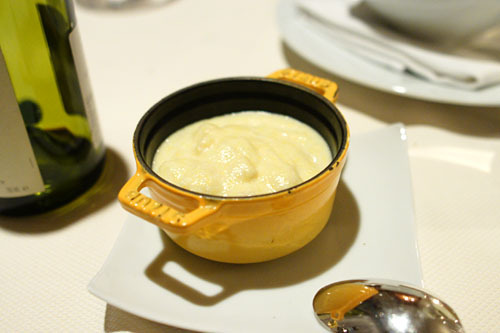 The banana polenta, while rather tasty, was unnecessary in my opinion. 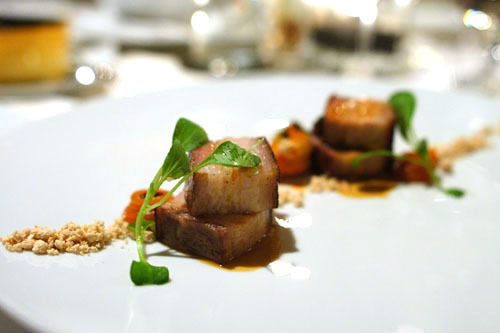 Pork belly, more often than not, is simply too fatty, too decadent by itself. It needs some sort of counterweight. 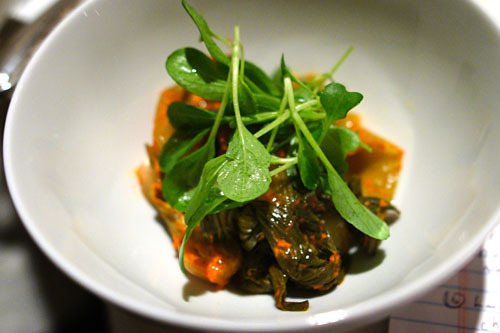 The bok choy kimchi was a perfect example of such, a pungent, piquant bit of Korea that faithfully tempered the sheer lusciousness of the pork. I'm surprised at how well the nuttiness of the peanut powder fit in, too. On the right, we see the extra bowl of kimchi that the kitchen sent out for us to share--that was some potent stuff! For his lamb, Voltaggio channeled the flavors of the Middle East. 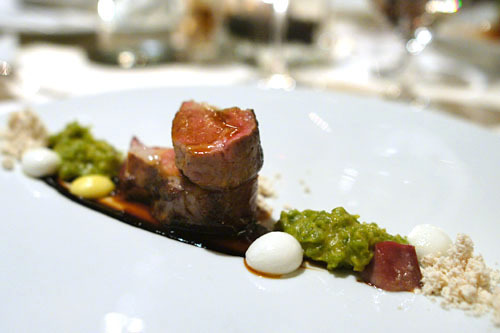 The meat itself was unwaveringly lamb-y, with a savory, smoky, and slightly sweet relish that was subsequently softened by the application of its various accoutrements--lemon, chickpeas, tahini, and yogurt spheres. 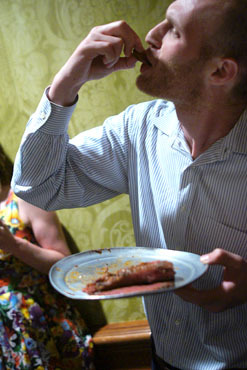 There were even bits of lamb tongue to enjoy. We were given a choice of "old and rare" or "eclectic" for our last libations. The table was split, so we ended up getting both! 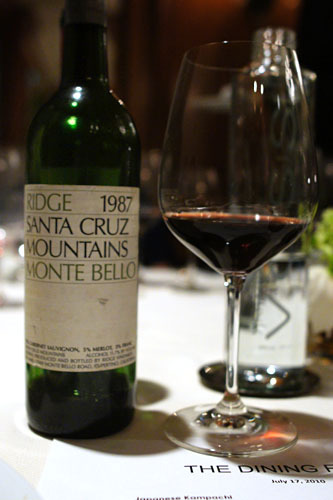 The 1987 Ridge Monte Bello--92% Cabernet, 5% Merlot, 3% Cabernet France--represented "old and rare," and was reminiscent of an older Bordeaux, showing off powerful flavors of currant, tobacco, smoke, and earth, all with some astringency on the tannins. 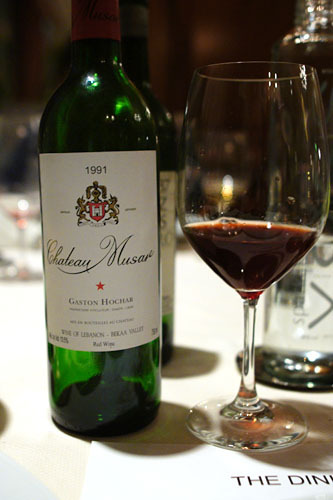 "Eclectic," meanwhile, brought us to Lebanon's Chateau Musar, 1991. Compared to the Ridge, this was a somewhat brighter wine, with a red fruit-dominated, herbaceous character, along with more barnyard notes as well. What we had here was pretty much the embodiment of wagyu beef: fatty, flavorful, uncompromisingly rich, well-integrated, and brazenly decadent. The only thing really holding back the power of the beef was the turnip, which did an admirable job, but ultimately proved futile. The accompaniments of fried béarnaise and bordelaise were fine enough, but I actually preferred to enjoy the beef sans sauce. 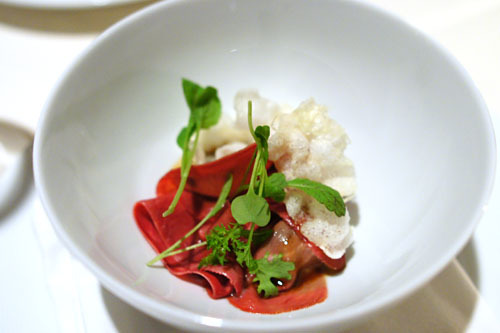 The beef cheeks were cooked to a fantastically tender texture--chewing was barely necessary! Flavorwise, the flesh demonstrated a mah-velous "beefiness," which went a long way with the classic accompaniments of mushroom and garlic (in chip and air form). 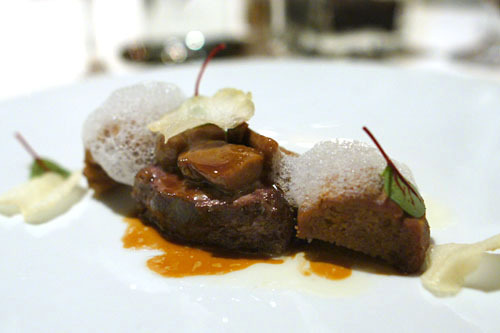 Our final savory of the evening was another presentation of wagyu, this time in short rib form. 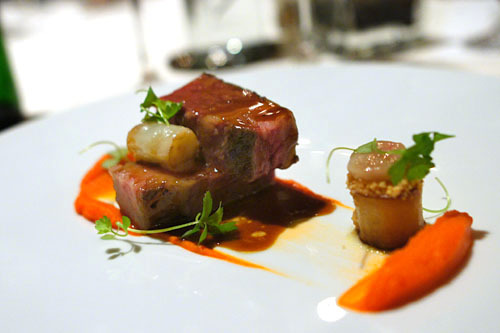 Described by our server as a take on "pot roast," it came replete with potato confit and Nantes carrot purée. And as with any great roast, this was suitably tender and full of flavor (kicked up another notch by the medallion of bone marrow), but bound in power by its vegetal concomitants. 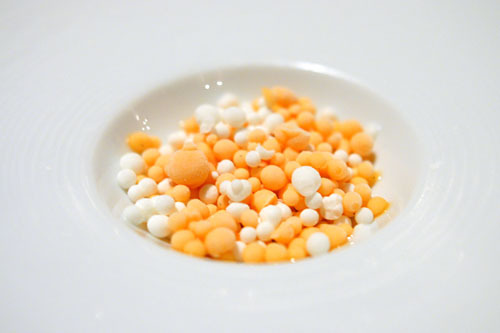 Tonight's "Dippin' Dots" featured the bright, focused flavor of peach, intermixed with the light, tangy creaminess of yogurt. A great prick to the palate! 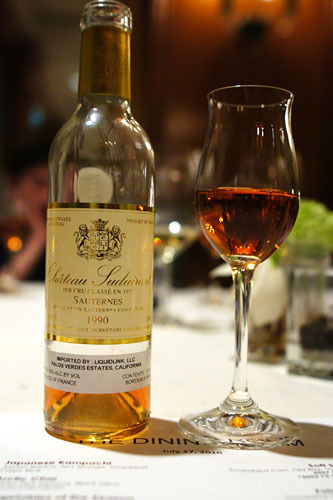 For dessert, Goldman provided us a half bottle of the 1990 Château Suduiraut. Showing off a beautiful dark copper hue, the wine was pure Sauternes, demonstrating botrytized notes of honey, apricot, caramel, and tropical fruit on the nose and the palate, balanced by a moderate acidity. The finish, needless to say, was long and lingering. This appeared to be a variation of Voltaggio's famed "Fool's Gold" dessert. The serpentine block of flexible ganache combined with the praline to form a classic but effective interplay of chocolate-hazelnut flavors, accented by a great bit of salt. 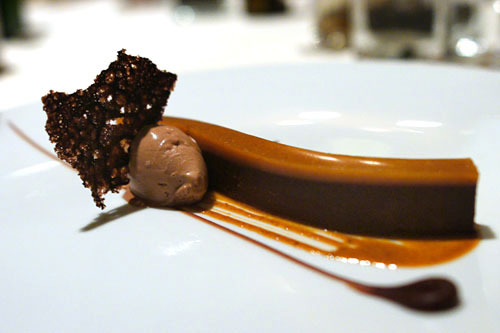 The cocoa tuile, meanwhile, contributed a fantastic crunch to the dessert. Here, the floral character of the lavender macaron combined with the rosewater cotton candy to form a floral flavor front that was balanced by the light tanginess of the panna cotta. 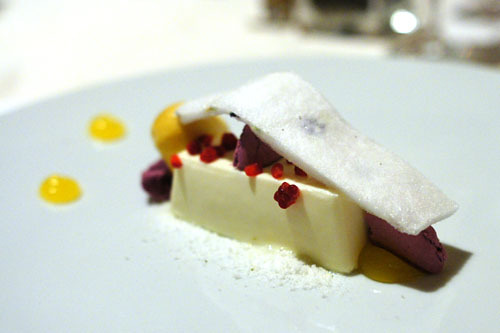 This whole amalgam was then set off by the bracingly tart vanilla-passion fruit sorbet. 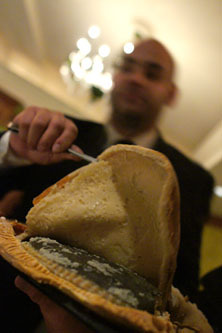 A rum baba is traditionally a miniature cake soaked in rum. 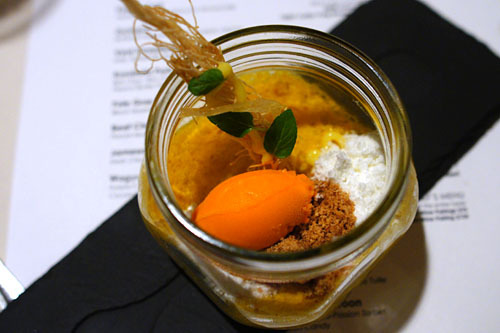 Voltaggio's version uses Myer's dark rum, adds in pineapple sorbet, cinnamon, cardamom, and nutmeg. 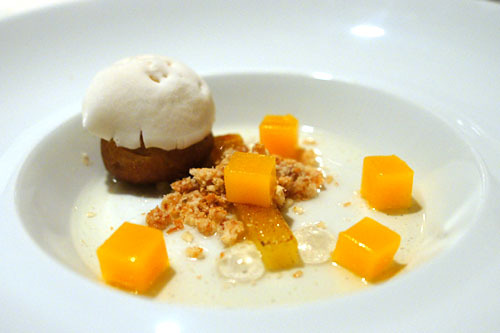 The resultant dessert is a tasty amalgamation of fruity and boozy flavors, in all sorts of textures. We ended with the Chef's potted carrot cake, which instantly reminded me of James Syhabout's version at Commis. This was actually more successful, at least in my eyes. I loved the textural variation at play, as well as the somewhat herbaceous notes present on the attack. The finish, meanwhile, was all about classic carrot cake flavors--sugary sweet, yet light at the same time. 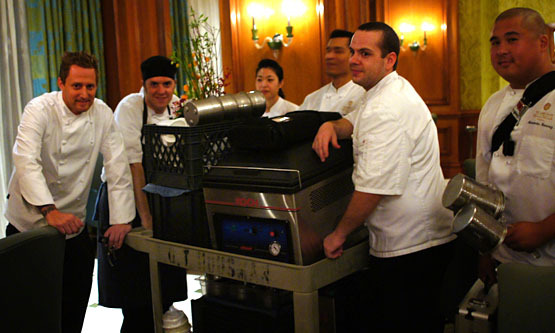 Dessert was briefly interrupted so we could see the Chef and company move out the last cartful of kitchen apparatuses. 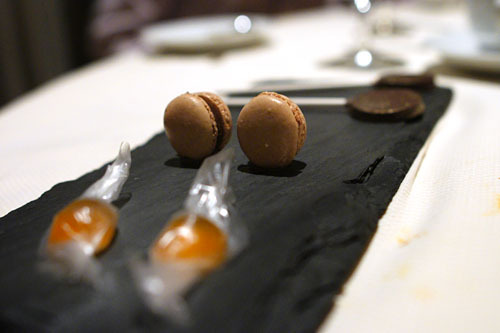 Mignardises consisted of passion fruit pâtes de fruit (replete with edible wrappers, à la White Rabbit candy), chocolate macarons with chamomile, and Voltaggio's famous pop rock-infused chocolate lollys. That's it. 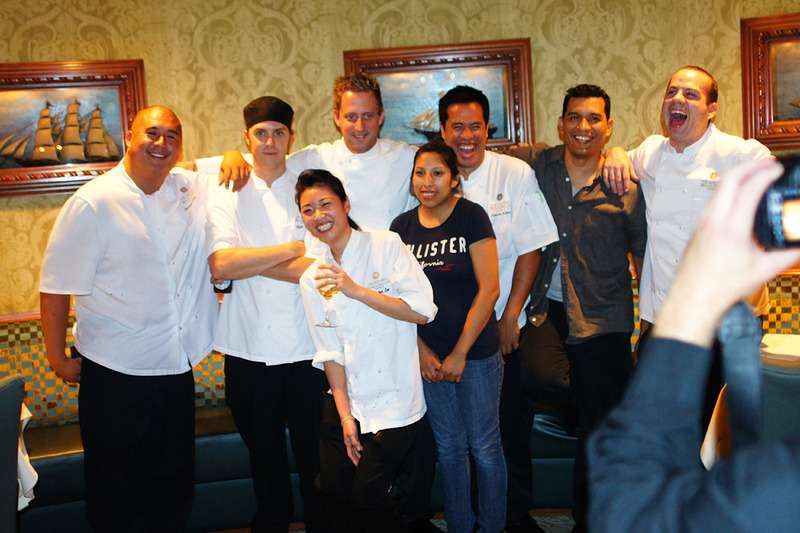 The Dining Room served us its last meal ever. I am honored and humbled. 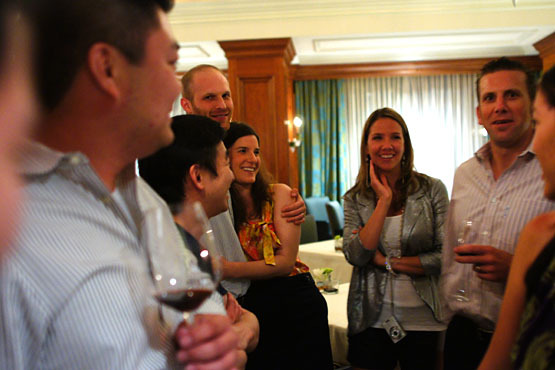 Following are photos from the post-dinner festivities. 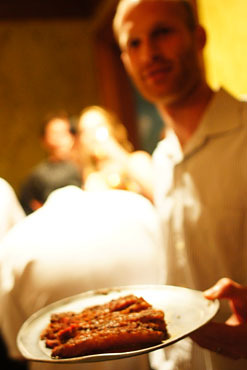 At one point in the evening, Saul Cooperstein decided to serve up a heaping plate of some of his famous pastrami (which I'd had previously at Hatchi). The pastrami, made from sous vide wagyu, was uncompromisingly decadent, melt-in-your-mouth, with a keen pepperiness to keep things in check. Despite being rather sated from dinner, we polished off the plate in no time. We then took a detour into the kitchen, stripped now of much of its paraphernalia. And now for some group photo action! And with that, we come to the end of an era. The Dining Room as we know it is done, finished, kaput. 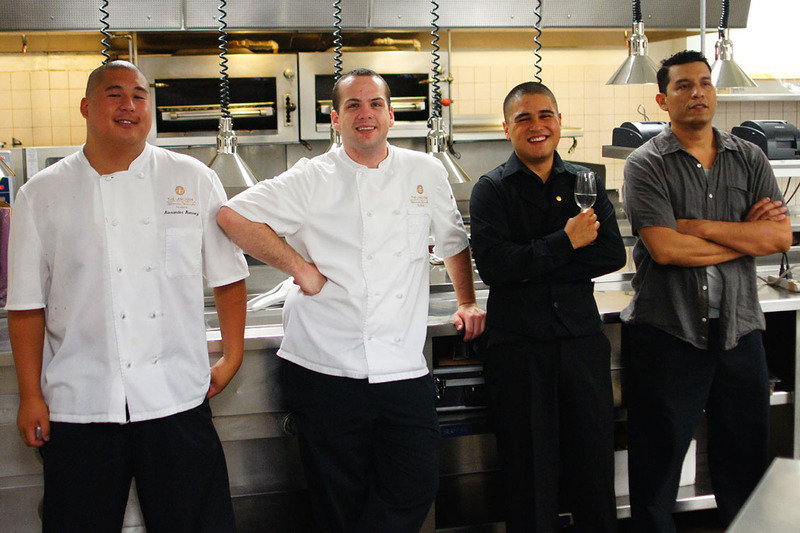 In the coming months, the Langham will completely transform the space into something far more contemporary--a far cry from the wood-paneled parlor that currently occupies the space--but who will be the new chef? I'm sure that the hotel will find a suitable replacement, but the more intriguing question concerns Voltaggio's plans for his own restaurant, which is slated to open by the end of the year. We asked the Chef for details, but he remained tight-lipped, only giving away that his place will be on the Westside, probably between Beverly Hills and La Brea (i.e. prime restaurant country). 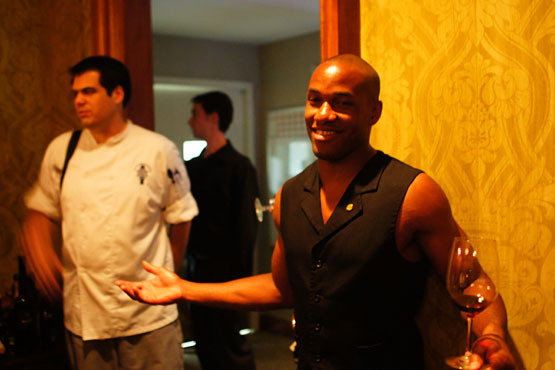 It'll be a more casual affair, though he does plan to offer a Table 21-esque chef's counter featuring an "omakase" menu. 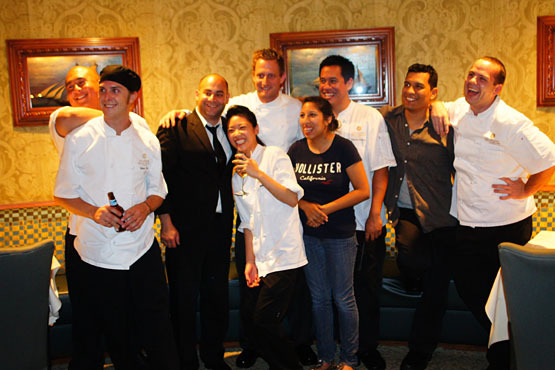 Wherever he lands for the next chapter of his culinary career, you can bet that we'll be sure to follow. 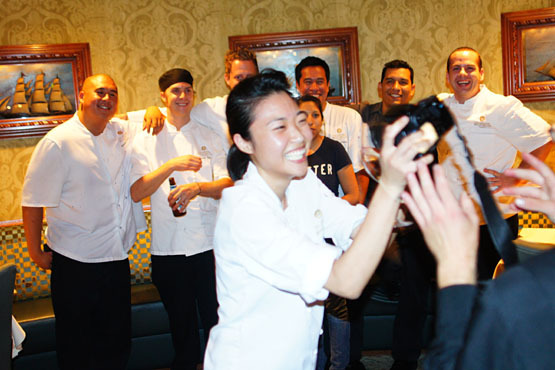 Hats off to Michael, Josh, and company--the best of luck in your new endeavor! Brilliant. Wish I was there. Yet another great post, Kevin! Your write-up did that glorious meal justice. Plus, I love the candid shots! Looks completely incredible -- the Voltaggio brothers both seem to be doing exciting things. 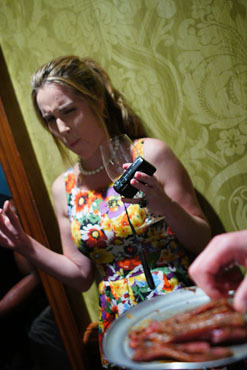 I have to ask -- what was the price tag on that wine pairing? Don't usually see those bottles on a wine pairing, even at a 3 star restaurant. i knew you and your camera would do that meal justice! amazing shots, as always kevin. great 2 meet you finally. sygyzy: Thanks. This was definitely one for the ages. mdp: They only charged us the normal wine pairing price, so obviously they were taking some liberties with the bottles (e.g. that Ruinart alone was $640 on the wine list! ), given that it was the final night. Krista: Great to finally meet you too--I love that thumb sucking pic! Anon: It was a lot of food; we were all pretty stuffed by the end of it. Voltaggio's already gotten noticeably better in the year that The Dining Room's been open, so hopefully he'll continue to grow. Just discovered your blog via LA Times. 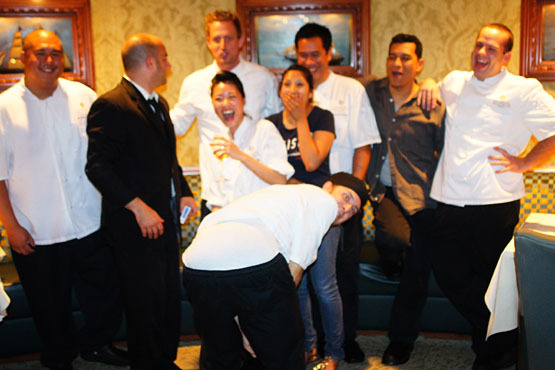 Love it and looking forward to your restaurant reviews and will live vicariously through you. Oh! I love the "Dipping Dots". :) How can I follow your Blogspot, Kevin? Jen: You know what, I'm not sure--I've never actually done it before. Try looking here. Glad I could be of service Sharon! Did you ever have a chance to eat at The Dining Room? I haven't eaten most of these things by the sound of it. 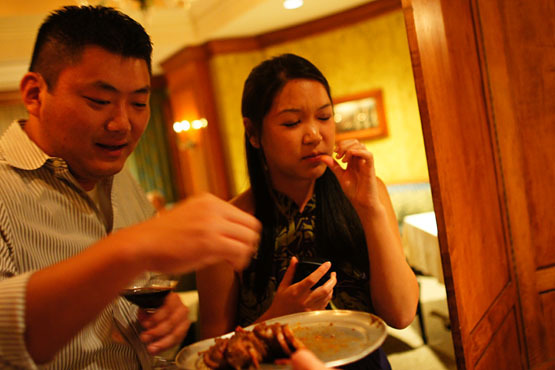 *sigh* What was the price tag of this 22-course meal? And the wine pairings? Did you eat everything? I wouldn't have been able to. The price was actually the price of the normal tasting menu, $110, so obviously we got a nice discount. And yes, I was able to eat everything, but was quite full by the end of it!